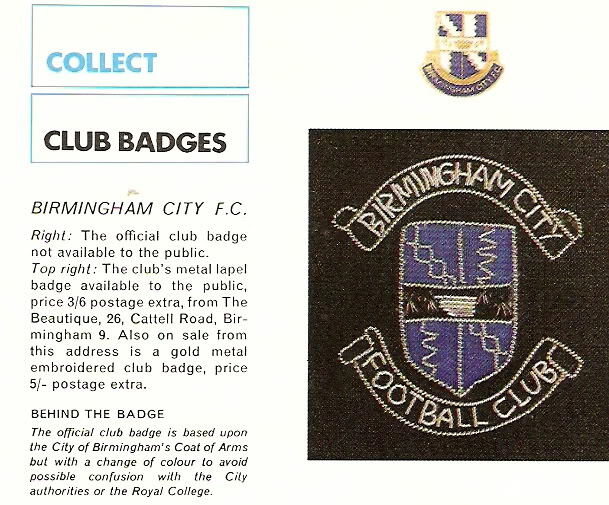 Birmingham Citys football badge history is fairly straightforward although it does have a very interesting twist to the introduction of the current badge. 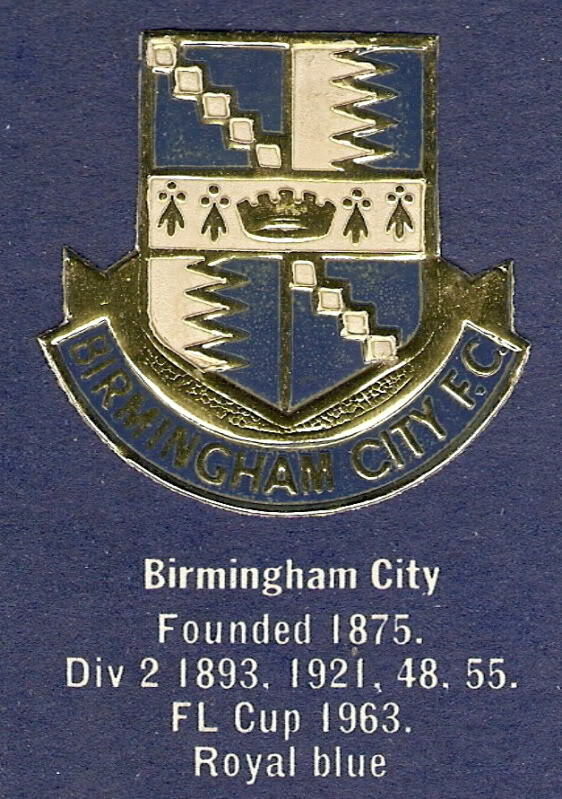 The club originally adopted the City of Birminghams coat of arms when they changed their name from Small Heath to Birmingham in 1905 and this remained untill the early 70’s. Below is an example of the original badge which has been (apologies for the scan quality) taken from a Football Review magazine from the late 60’s – early 70’s and interestingly enough the text describes how the badge isnt available to the public …. how times have changed commercially !! The picture below shows another example of the badge, this particular version was given away as part of a promotion by Esso and was designed to be stuck in an album along with 75 other teams badges. The winner was a guy called Mike Wood, naturally a Blues fan himself, who designed a badge incorporating the world, a football and the text Birmingham City Football Club 1875 on an entwined scroll. The design was enthusiastically embraced by the club who said “it is forward looking and introduces the globe and the idea of European football which is what everyone wants to see at St Andrews”. Despite the ever rising tide of commercialism that has enveloped football clubs today and seen many clubs change their badge it is testament to Mike Woods design that it remains Birmingham Citys football club badge to this day. After all, there cant be many teams left that have a badge designed by a fan ! !